Magnetic Resonance Imaging (MRI) uses strong magnetic fields and radiofrequency pulses to produce detailed images of bone structures and soft tissue. Our low-field system allows us to acquire images of the distal limb in the sedated, standing horse. In comparison to general anesthesia, standing sedation allows for faster anesthesia recovery and drastically reduces the risk of injury. During the MRI, we gather images in multiple planes, which allows the radiologist to precisely locate the cause of the issue. 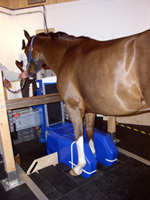 Depending on the temperament of the horse, the exam takes between three and five hours MRI allows us to diagnose lameness or injuries that may not be apparent via other imaging techniques such as radiography or ultrasound. For more information about what to expect during your horse’s MRI at our clinic, please refer to our MRI Frequently Asked Questions page. Nuclear scintigraphy, commonly known as a "bone scan,” or "NUC” is a diagnostic procedure used in lameness cases. An intravenous radiopharmaceutical (Technetium-99) is administered to the horse. Then, the horse is returned to its stall. While in the stall, the radiopharmaceutical accumulates in areas where bony remodeling is actively occurring. A specialized camera delineates areas of increased radiopharmaceutical uptake (indicating injury) in comparison to uptake in healthy tissue. This type of imaging is especially useful for diagnosing injuries that are difficult or impossible to visualize with radiographs or when the horse has multi-limb lameness. The imaging process takes approximately six hours to complete and an overnight stay is required to ensure elimination of the radioactive isotope from the horse’s system. For more information about what to expect if your horse has a bone scan at our clinic, please see our Frequently Asked Questions (FAQ) page. Digital radiography (DR) allows for detailed diagnostic studies of bone pathology. San Dieguito Equine Group utilizes state-of-the-art portable DR systems in our practice. Each ambulatory vehicle is equipped with a portable DR system allowing for our veterinarians to acquire radiographs in the field without delay. Preliminary review of the images can take place in the field; however, final interpretations are made on high-resolution monitors at our practice. San Dieguito Equine also has an in-house DR system for clinic appointments. All images are archived to a cloud-based server and can be emailed to owners or consulting veterinarians. Ultrasound is a valuable imaging tool used to visualize soft tissue structures in the horse. Joint, tendon, and ligament injuries can be diagnosed and monitored using this modality. It also allows for evaluation of thoracic and abdominal organs for horses with suspected systemic illness. San Dieguito Equine has ultrasound units in each ambulatory vehicle and at the clinic. All images are archived to a cloud-based server and can be emailed to owners or consulting veterinarians. Endoscopy and gastroscopy are important tools for evaluating a horse’s upper respiratory tract and stomach. Endoscopy aids veterinarians in investigating respiratory issues such as coughing or chronic nasal discharge. Evaluation of the upper respiratory tract is possible in the field. Sedation is not required for endoscopy procedures. Gastroscopy is used to accurately diagnose stomach ulcers, which can cause signs of colic, weight loss, and poor performance. The horse is fasted prior to the procedure and sedation is required. The horse may return to their normal routine shortly after they recover from sedation. Currently, the procedure is primarily performed at our clinic. In the near future, San Dieguito will be able to perform gastroscopies in the field.Both scoping instruments are equipped with a monitor that allows our veterinarians to visualize key anatomical structures during examination. Portable and video devices are available at San Dieguito Equine’s clinic. Recording capabilities allow our veterinarians to save images for medical records or for outside consultation. Thermography utilizes a specialized camera to detect infrared waves, which cannot be seen by the human eye. For visualization purposes, the camera converts the waves to an image called a thermogram; the thermograph delineates areas of increased or decreased heat. Increased heat indicates increased circulation which can be correlated with inflammation. In contrast, cooler regions may indicate tissue scarring, reduced circulation, or disrupted nervous system conduction. A change in one degree between two comparative regions is considered abnormal. Thermography is useful for diagnosing lameness, saddle-fitting issues, and monitoring healing. The procedure is noninvasive, does not require harmful radiation, and is well tolerated by horses.